Exeter University II have never won a knock out competition, and finished 6th in Division I with a 6/11 record, in the league they beat Tigers by 20 at home and lost by 9 points away – they have had an unbeaten season in BUCS though. 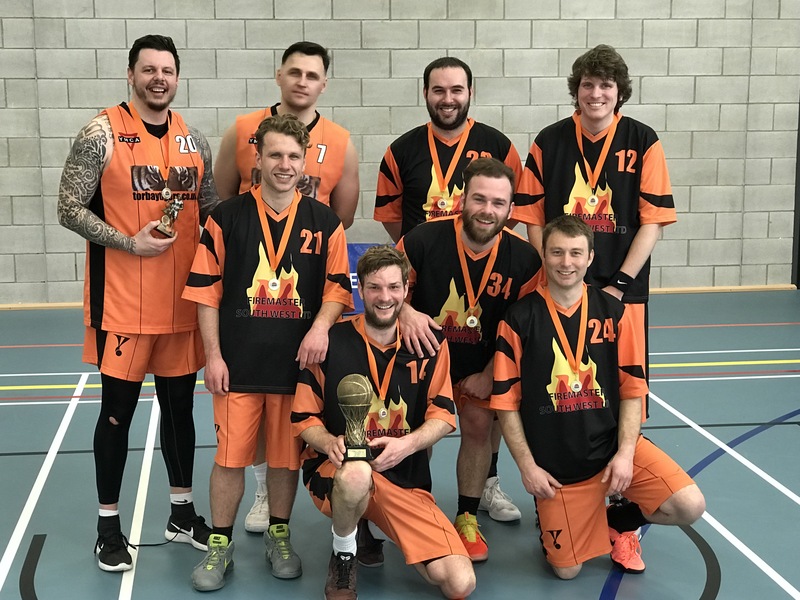 Torbay Tigers finished 5th in Division I with a 8/9 record, and have won the Inter Division Play Offs once before and the Division I Play Off’s twice, and they will always competitive! Ross LITTLE scored the first two baskets for Tigers and looked to banish some of the recent struggles he has had, however Theo SPIRA scored two successive 3 pointers to keep Uni’s nose in front. The response from Tigers was a 3 pointer from Greg STEWART (who would’ve thought it), and that man Ross LITTLE again. Uni were passing the ball well, and eventually finding the free man who now appeared to be Octavi CASELS-FARRE with a brace of baskets, and Theo to add another 3! Tigers had to find a threat, and rolling back the court time up popped Jay MARRIOTT with a basket, 2 free shots and then a brace of 3 pointers to finish the quarter – Tigers lead into the break 19 – 15. The 2nd quarter starts fast, Uni using their pace and ball movement to find the gaps, up pops Theo for another 3, and then Eduard FLORESCU steps up with a solid 10 points in the quarter and Erikas PTAKAUSKAS finishing the quarter with 5 points including a 3 pointer. The points were being spread around Tigers to keep in the game with MARRIOTT scoring some important baskets – the first half ends with Tigers holding a slight lead 35 – 33 – this game was turning into a classic encounter. We enter the 3rd quarter after the 10 minute break, the music was blaring ‘The Greatest Show’ and the crowd were enjoying the action, Uni supporters had brought their ‘pots and pans’ and vocal support and they were going to be heard! Two quick 3’s by PTAKAUSKAS meant Uni took the lead, and the Uni players were spreading the threat and everyone was contributing – Tigers were working hard to find the space, up stepped Rafal CIECHACKI with a solid 9 points and that man MARRIOTT on the buzzer with a 3 pointer – the 3rd quarter ends level – 53 all! This could be anyone’s game with the 4th quarter starting, and it was a game that to be fair no one should lose, the plays were impressive, the match ups complete. Neither team wanted to lose ground and baskets were being traded, after a quiet couple of quarters Ross LITTLE found his way inside again and added two baskets, Theo SPIRA found his range again and added 2 baskets and Erikas PTAKAUSKAS hit two ‘3 pointers’ that looked to have the game wrapped up going into the closing seconds, but MVP Jay MARRIOTT didn’t want to end up on the losing team and dropped a 3 pointer with seconds left to level the game, and just as we all thought the game would be going into overtime MARRIOTT squeezed past two defenders on the edge of the key and was fouled – two shots from the free throw line to win the match – the noise of the ‘pots and pans’ was deafening, and he misses the first, MARRIOTT has played with the best of them at Raiders and he calmed himself and the 2nd dropped – the Uni supporters fell into silence – the game was won 70 – 69. There should be no losers in a game like this, the standard was high, the game intense, quick aggressive and full of skill, ably supported by the officials Mark LEACH, Rob WILLIAMS and Dave MONTGOMERY – this was a great advert for local basketball and a great venue – the show court at Exeter College. Exeter District Basketball at its best and the crowd loved it!